Home News Club News What Has 20 Eyes And Makes A Lot Of Noise? What Has 20 Eyes And Makes A Lot Of Noise? What has 20 eyes and makes a lot of noise? Nope, it’s not a cicada, or jar fly as it’s called in East TN. Here’s a hint: we had 10 cowgirl shooters at the August Shoot. OK, Too Tall: that’s 10 cowgirls X 2 eyes each. Get it? 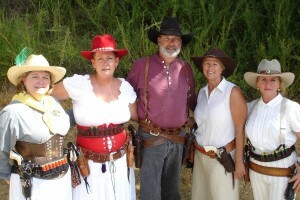 The picture below shows the cowgirls of Posse No. 3, Tombstone’s posse. Of course they don’t really like him all that well. Deadman threatened to shoot’em if they didn’t stand close for the picture, but that didn’t faze’em, no better than he shoots. Last Kiss had to make the same threat before it worked. In total, we had 72 shooters out on the range shooting steel varmints. Read the rest of the article here.